We are extremely thankful to all those who have taken part in saving our daughter Suzu’s life, especially to the volunteers who have stood up to establish the “Save Suzu Foundation”. Our daughter Suzu was born on November 21st 2014, as a twins with her sister Saya. Although a little small at birth, they were both healthy until 2 months old. However, Saya stopped gaining weight after around 2 months of age. After a few days of not drinking any milk, she became limp and we rushed her to the hospital. As a result of repeated visits and several examinations, we found out that the cause was severe heart failure and she was quickly transported to the National Cardivascular Research Center by ambulance. She was in such a state that we did not know if she could survive the next day. The following day, after being transported, she went through examinations and was diagnosed with “Severe Pulmonary Hypertension with the progress of Pulmonary Vein Stenosis”. Seeing our daughter connected to the ventilator was heartbreaking. We were struggling and just could not accept the reality of her disease, but before we could　come to terms with it, we were told from our physician that there was not an effective cure for this disease. 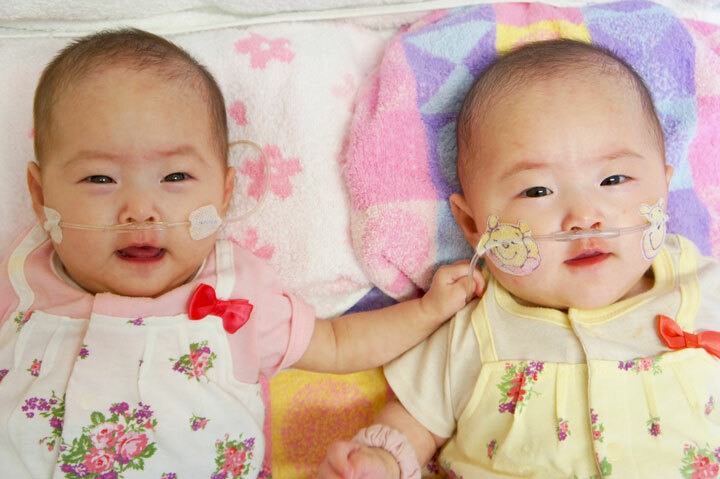 As twins, we soon became worried whether Suzu was also subject to the disease and so hurried her for an examination at the hospital. In our hearts, our intention of taking Suzu for an examination was to feel reassured that she was not of the same disease, however, although there was a difference in the symptoms, we found her to have the same disease. From this time on, our severe battle against the disease began and we had no idea when it would end. The doctors thought of ways to treat Saya by searching for similar cases around the world, however her condition began to worsen around 7 months of age. Her main physician told us to start thinking about how we would want Saya to spend the remaining days of her life that she had left. In order to keep her alive, there was no other way than to receive a lung transplant. Finally, after 9 months of fighting against the disease, she died at only 11 months of age due to a seizure of pulmonary hypertension. This was the day right after her registration of cardiopulmonary simultaneous transplantation was certified to the organ transplant network. 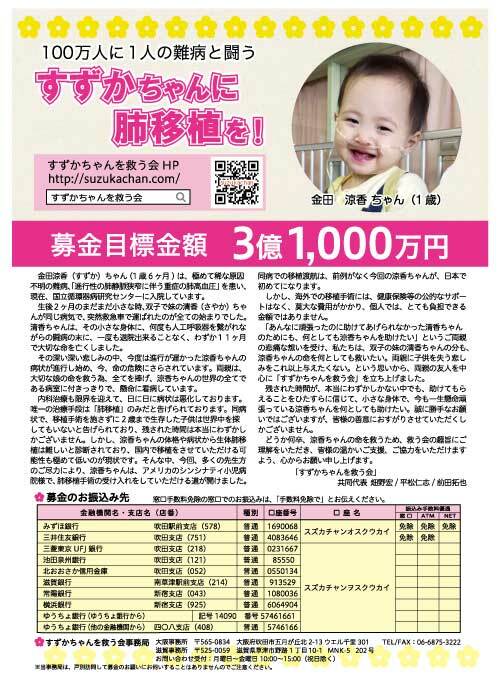 While the condition of Saya’s disease was progressive, Suzu’s state had been fairly stable. At one point, we believed that Suzu would be able to grow even with the disease as long as she had sufficient care. However, in November 2015, her BNP figures which show the pressure against her heart started to go up and her condition suddenly started to progress significantly. Suzu is currently inhaling high concentrated oxygen and continuing oral medication, infusion and administration of inotropic agents but the pressure on her pulmonary arterial is continuing to rise and her conditions of right heart failure is progressing. Her heart is reaching its limits and it is at a dangerous state where it could cause pulmonary hypertension at any time. The time that she has left is very limited and she requires a transplant as soon as possible. With the limited amount of time that she has left, we have decided to take a chance for transplant surgery overseas as the possibility that Suzu can receive a transplant in Japan is extremely low. Thanks to the efforts of our doctors, Suzu will be accepted to Cincinnati Children’s Hospital in the United States. However, the cost of transplant surgery overseas is beyond the sum that our family can pay individually. We know this is selfish of us to ask others for help, but if possible, we would like to ask for your kind donations to save our daughters life. Our daughters, have been fighting so hard with their tiny bodies against this disease everyday since they were only a few months old . The life they know is far from what an ordinary life of an infant could be. The pain we feel, seeing them like this, is beyond words. For the sake of Saya, we are even more determined to save Suzu and show her a world which is not confined to the bed in the hospital. Please help us give Suzu a chance for a future. We really need your kind support and contributions to make this possible in the limited time that she has left. Saya on the left and Suzu to the right. Both at the age of 5 months.